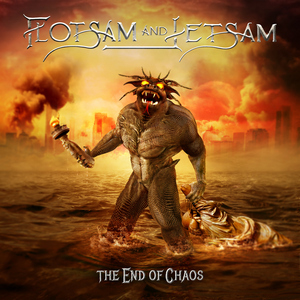 Flotsam and Jetsam show no sign of wear and tear on their latest full-length, The End of Chaos. Even though the Arizona thrashers are best known for hatching the career of ex-Metallica bassist Jason Newsted, they have never been content to rest on that accomplishment. Sure, Doomsday For the Deceiver is a possible candidate for a top ten best thrash album of all-time, but was a merely a beginning. Fast forward thirty-plus years to the current recording and listeners will find the group still possess the magic from the early days, but have progressed technically and modernizing their production. The End of Chaos is a riff-hungry album. No matter how much you get, they keep feeding you one tasty riff after another. The progressions are numerous, but every song thrives on hooky guitar parts with a classic familiarly. Whether it’s the thin-string tapping melodies made famous by Maiden, bruising ‘90s groove or the speed picking of early material, Michael Gilbert and Steve Conley present one memorable riff after another. None of the members detract from the greatness of the album. In fact each musician offers memorable parts of their own, but vocalist Eric A.K. is the driving force. His range is astounding. He has the ability to hold a note for eons. As some of the guitar parts relate an Iron Maiden influence, A.K.’s singing style and tone are a dead ringer for Bruce Dickinson. However, there is an anger that appears with the Flotsam singer not so visible from Bruce. The aptly titled finishing track “The End” shows him push his voice another octave nearing Michael Kiske of Helloween. A.K. has a knack for writing powerful vocal hooks through repetition. Foot-tapping beats drive home the intense vocal refrain on “Recover,” while “Prepare For Chaos” includes a chorus line about a beast roaming the earth killing to feed its hunger. The speed-picked guitar and double bass encircle his horror story. It’s unfair to not give The End of Chaos a chance because it doesn’t live up to Doomsday for the Deceiver album, because Flotsam and Jetsam have consistently released good albums. It might not have that freshness and originality of their debut, but it’s a solid record, nonetheless.